Now that we are officially in February this marks the end of my first craft month. But before I announce my next craft task I need to update you on how January went. There just isn’t enough hours in a month to take a craft by the horns and make something spectacular. Then again an end result doesn’t necessarily have to be large scale. Like the majority of people I have a full time job and try and juggle lots of other things on top, but I don’t want this to deter me from crafting. So even if I don’t make something large or particularly fancy I don’t care, for me I have still accomplished a new skill and maybe even a new finished product. 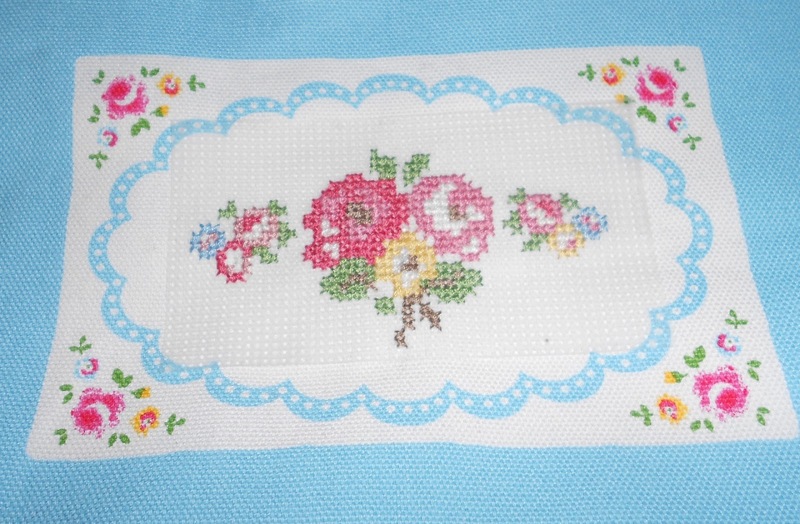 My Cath Kidston cross stitch is now completed and all I have to do is remove the soluble material and sew up the bag. Although it is small scale I am really happy with the result. On the whole this cross stitch has been simple to do, it is a craft you can do in front of the TV but you still do need to have some wits tuned in to ensure you count correctly......which I learned the hard way. 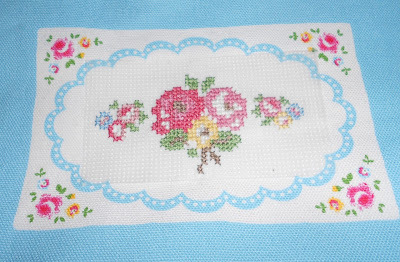 The one thing I have learnt with cross stitch is that it is important to have a good light source. I usually do mine late evening, the light in my rooms are not so great so sometimes I found it quite challenging to see the holes in the soluble fabric properly. That aside with a desk lamp I reckon you would have no issues. 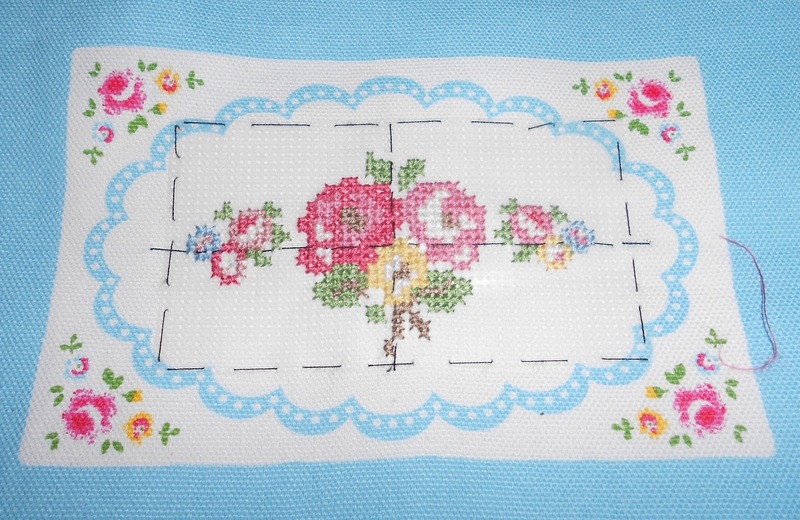 Here is the finished version of my Cath Kidston cross stitch. Truth be told the second set of flowers on the left are supposed to be identical to those on the right. Not only did I manage to lose my thread, I counted wrong too, hence the free styling. Bet you didn't even notice til I just said! But my crafting ambitions are never fulfilled and with every craft I do I am always keen to design my own pattern and do my own thing. I bought some oatmeal colour 14 point fabric and bought a selection of threads in my favourite colour ways, pastels! Being presented with a blank canvas and no pattern can be quite daunting! So simple was the key! 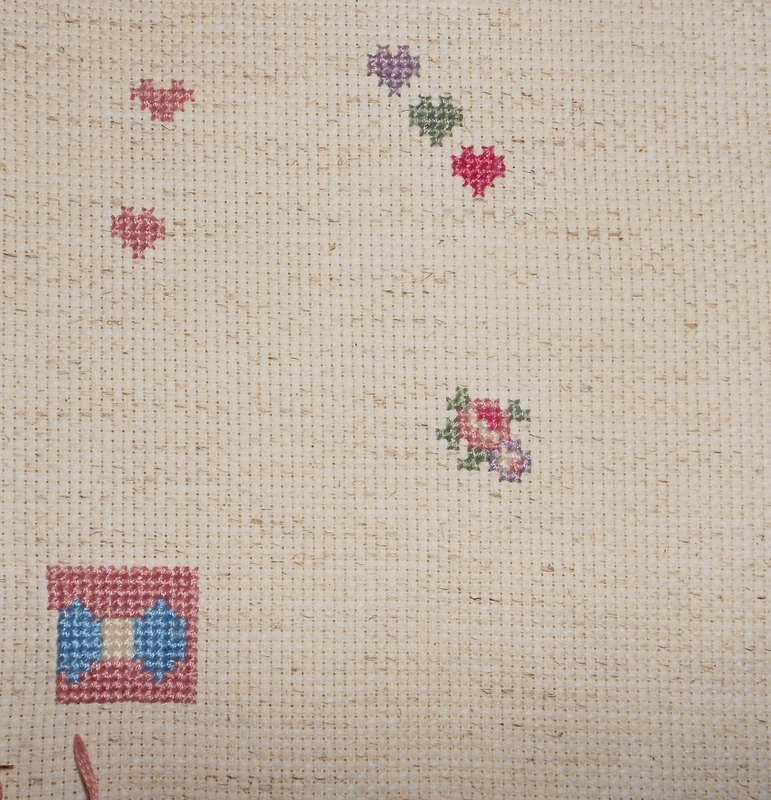 I started off dabbling with some small simple hearts and then decided to take a section of Cath Kidston’s design, change the colour way and amend the design a bit. Small simple designs were what I wanted to create. Happy with the results I decided that I wanted to create a design which would be all colour. I came up with the idea of stitching a bow and colouring in the space around it. This I did with no previous inspiration unlike the hearts. I tried to sketch out my idea on squared paper but it was hard for me to visualise , stitched so I decided just to take the plunge and start with the centre of the bow and work outwards. It is the most basic shape but I think the design really stands out due to the colour palette. Feeling pretty happy with my designs I decided that I didn’t just want to leave them on the fabric to eventually gather dust in a drawer. 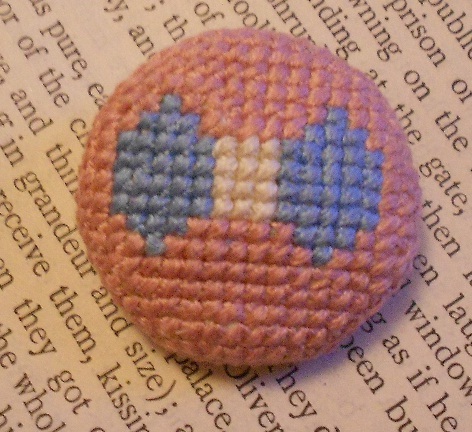 I’d seen many people do mini cross stitch designs and make them into buttons, so sweet and versatile. Being a fan of buttons and using self covering buttons to make jewellery I naturally started to head down that vein. Making a button using self covering buttons. Finished floral button, I love it! I decided that I wanted to do the same with my bow design and mounted it onto a larger self covering button.